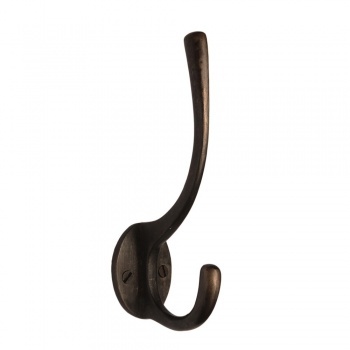 This Cardea hat and coat hook has been hot dipped in boiling oil and finished with a dark wax coating. It has an almost black, dark bronze finish, through use and time, the metal will lighten achieving the classic coppery lustre. The dark bronze hat and coat hook is a perfect, practical solution for keeping your cloakrooms and hallways tidy by hanging items of clothing such as hats, coats, bags and scarves.